Always at the forefront of furniture fashions, Habitat has spent more than 50 years providing the UK with stylish home interiors. From the garden gate to the front door, from the bedroom to the bathroom, Habitat has a wide range of solutions to personalise your space with. With cool creativity and colourful craftsmanship informing every element of its design, Habitat has established itself as a brand of class and distinction. With a wide variety of styles available at great value, Habitat can help you create your ideal living space. From fairy lights to candlestick holders, Habitat can help you get your mood lighting just right, so you can set the tone of your home exactly as you want it. From cupboards to sofa beds, and from armchairs to bookcases, Habitat can help you sort out the cornerstones of your home. With coffee tables, dining tables, bedside tables and dressing tables, if you need to turn the tables on your interior design you can’t do better than Habitat. So, whatever you’re looking for, make it sensationally stylish with Habitat. 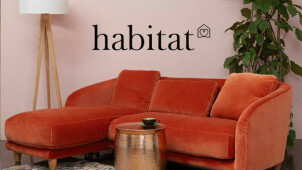 How do I use my Habitat discount code? If no code required, discount included in your final price! Get access to exclusive news and deals by signing up to Habitat’s mailing list. Can I preview a Habitat upholstery sample? By selecting ‘Order Fabric Sample’ on your desired product page you’ll receive a free upholstery sample within 7 working days. Do Habitat offer free delivery? Habitat offers free items on all furniture orders over £500, or orders over £50 for small items. What payment methods do Habitat accept? Habitat accepts payment by PayPal or by debit or credit card via Visa, MasterCard, Switch and American Express. Are my details safe with Habitat? Habitat takes the security of its customers very seriously and will never share your information with a third party. To find the contact details of your nearest Habitat, see their store locator. Habitat accepts returns on all items returned in their original condition within 7 days of delivery. To find the trading hours of your nearest Habitat, see their store locator. When Habitat set up shop in 1964 they had a simple plan, to offer a fresh take on interior design as a funky alternative to the dreary post-war norm. Today, stronger than ever, Habitat is a national institution, offering stylish homeware to millions of happy customers. Save a packet on the cost of your purchase with a Habitat discount code and whether you’re after a new sofa, dining table and chairs, or just a lovely Habitat lamp, you can get it all for less. Since inception, Habitat has consistently been at the cutting edge of homeware. Having sparked outrage a few times over the years, Habitat is a firm believer in paradigm breaking. Working with groundbreaking artists such as David Hockney and Tracey Emin, Habitat has consistently stayed at the cutting edge of art, fashion and interior design. Their products reflect this, offering stylish, contemporary design and classically cool construction. With the long days of summer finally here, you're going to want to visit the Habitat furniture section to find dining table sets, individual chairs and the like! Now you can invite the whole family round for a summer barbie to have them see and sit on your new chairs, and they'll never know you were nifty enough to pick up a Habitat voucher code to use at the checkout! With cool contemporary pieces to choose from, your home and dining room space will look effortlessly chic with tasteful furniture solutions from Habitat.